Tiki fruits is brought to the market from Progmatic Play and boast an eight-reel, 10-payline online game, who create some of the best slot games UK. The game is compatible with all devices including mobile technology from both Apple and Microsoft providers. It is a bright UK video slots theme which is sure to put you in a good mood and the bonus elements include free spin rounds. Getting down to business, the payouts can mount to up to 2,000 times your original stake. Players can bet between 20 pence and 40 pounds per spin so it appeals to the masses. Pragmatic Play is one of the foremost providers of online the online gaming community and produces multi-product content to the iGaming industry. Their slots are renowned for being iconic and well themed. They have a strong library of games that will accommodate a large range of audiences. They are known for using HTML5 software and have developed their games specifically for mobile devices as these are now the most common form of platform to play online slot games. Their games work in over 80 different countries. Some of the classics include Da Vinci’s Treasure, Great Rhino and the award-winning Wolf Gold. This game has a cartoon-like vibe about it which creates quite a fun atmosphere when playing. It is fun to get back to the old school days for a change without having dramatic themes. Read more from our guide and play best slots with breathtaking themes today. The background of Tiki Fruits is a beautiful beach. The symbols that are adopted here include the classic fruit symbols which fit with the traditional style slot games. These include cherries, lemons, oranges, grapes and melons as well as dice, bells, stars, diamonds and lucky 7s. Simply land winning combinations on the reels to win! These can be either horizontal or vertical. 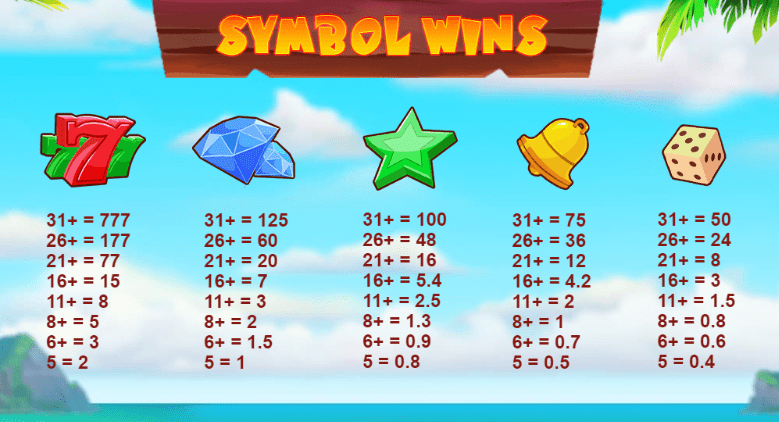 Notice the symbols on winning combinations change after they have been won, this will keep happening to form clusters. The best payout from this feature in granted by landing 31 of the old school lucky 7 symbol – paying out 777 times your original stake! Bonus rounds are triggered through the coconut symbol and collecting the right amount will lead to the Tiki free spin rounds. The totem poles will also give an increased chance of landing winning symbols. 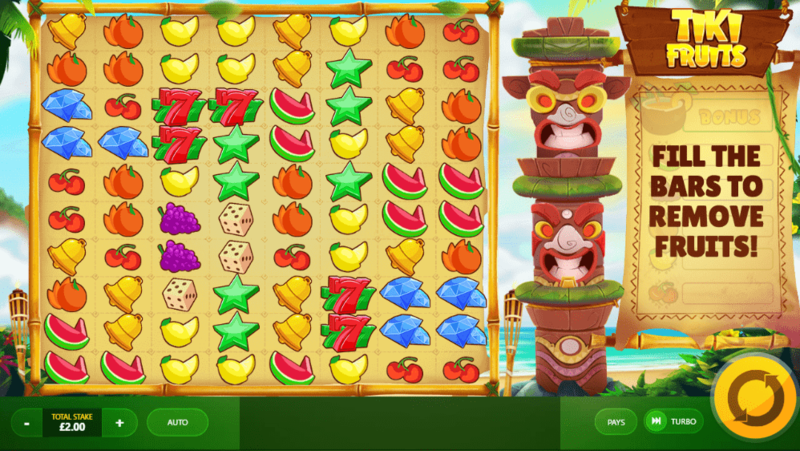 Tiki Fruits is refreshing in the sense that it rejuvenates the traditional fruit style slot game with a new, digital feel. However, it lacks some creativity in terms of bonus rounds. It is worth getting involved though because there are lots going on and the free spins and culture features will not disappoint! It’s also easy to keep track of what is going on due to the metres that run at the side of the game – bonus symbols are collected in these metres and you just have to fill them to trigger bonus prizes! So get back to the traditional days and hope for that lucky number seven symbol! Now head to the ball with Masquerade!